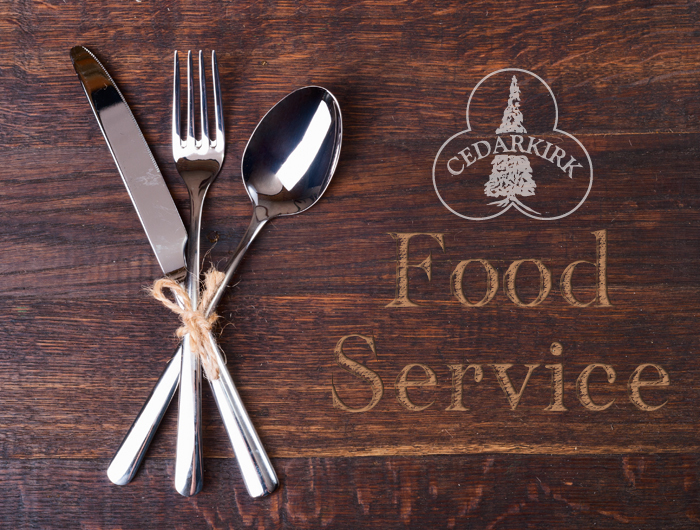 Cedarkirk is proud to offer full food service, providing delicious, home-cooked meals at your request. We consider sharing food and fellowship around the table to be one of the foundations of our ministry, so all of our meals are served family style with a volunteer from each table picking up the tray of hot food from the serving hall. Our meals are served in the upstairs and downstairs dining rooms of Cedar Lodge, with three meals typically served at 8:30 am, 12:30 pm, and 5:30 pm. On Fridays, dinner begins at 7:00 pm to accommodate weekend travelers. Meal times can be adjusted under certain circumstances to better suit your group’s needs. A staff member will be present at each meal to explain our dining procedures and ensure that your group’s needs are met fully. Start your day with comfort food staples, such as biscuits and gravy or pancakes, as well as continental breakfast items like cereal and fresh fruit. Gooey, homemade cinnamon rolls are available upon request. Our lunch options range from chicken wraps to casseroles, with classic favorites such as tacos and sub sandwiches making appearances as well. Dinners include meat entree (guest favorites include meatloaf and oven-baked chicken), a vegetable, a starch, and our famous homemade dinner rolls. Lunches and dinners also include either a salad bar containing a variety of fresh vegetables and toppings for large groups or a bowl of salad at your table for smaller groups. We are happy to accommodate most dietary requests such as Gluten Free, Lactose Free, Vegetarian, and most allergies with advance notice. Our policy is to provide the usual meal for the group as a whole with a suitable alternative for the individuals who need one. When making arrangements for your group, please coordinate these requests with our Event Coordinator as soon as possible. In some cases, guests may be asked to bring alternative options if we are unable to accommodate a special request. Lastly, we also provide a variety of snack options for your group, such as muffins and coffee for morning meetings, s’more ingredients for a campfire, and communion elements for worship services. Several buildings also have kitchen facilities available for guest use. If you have any questions or concerns, feel free to contact our Event Coordinator. We look forward to welcoming you to our table. Below is a sampling of the meals served at Cedarkirk. Breakfast Menu: Also includes orange juice, apple juice, milk, bagels w/cream cheese, cereal, yogurt and fresh fruit. Blueberry muffins and/or cinnamon rolls are often offered dependent upon a group’s size and duration of stay. Lunch Menu: Also, includes served with veggie tray or salad bar, drink of the day and water and vegetarian option (if requested). Dinner Menu: Also includes, Salad bar, water, tea and a vegetarian option (if requested).